The purpose of this paper is to further the understanding of how unequal access to commons is (re)produced and contested. I do so by looking into the thwarted struggle of small-scale fishers in post-war Northern Sri Lanka to contest encroachment of an Indian trawler fleet. I contend that for understanding marginality in the commons we need to make two conceptual shifts in understanding resource access and collective action: one is from access as a bundle of rights to access as a bundle of powers (Ribot and Peluso 2003); and two is from collective action geared at fostering institutions for resource stewardship towards collective action geared at contesting marginalizing access mechanisms. 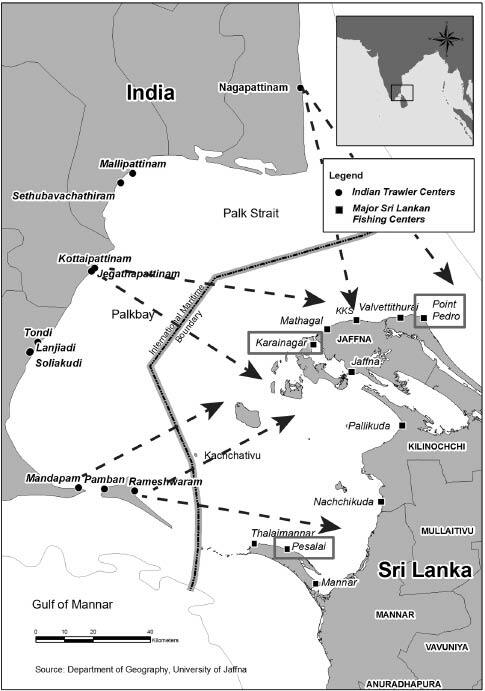 This paper uses this political perspective to explain how Indian trawlers’ superior technology and political agency allow them to illegally operate in Sri Lankan waters, and prevent North Sri Lankan fishers to rebuild a livelihood after decades of war. I subsequently demonstrate that fishers are unable to collectively challenge this status quo due to political repression by the Sri Lankan government, the post-war erosion of fisheries cooperatives, and fishers’ inability to articulate and politicize their Tamil identity. This elusive quest for access and collective action has forced fishers into silent and cynical adaptation to the reality of trawler intrusions. I conclude that struggles for resource access are not only struggles for legitimate property rights, but also about the ability to influence the multiple mechanisms of access through processes of contestatory collective action. Natural resources are frequently subject to contestation over access and control. Scholars have developed various conceptual frameworks to understand the mechanisms that enable and regulate resource access for users. New institutionalists such as Elinor Ostrom have analysed the conditions under which people develop institutions that allocate access rights. Political ecologists, on the other hand, have been interested in how power differences translate into inequalities of resource access and thus study the strategies that people employ to contest systems that undermine their rights and livelihoods. This paper, building on the friction between these approaches, enquires into the struggles of small-scale fishers to access fishing grounds when confronted with a foreign fishing fleet. North Sri Lankan fishers1 are struggling to regain access to their fishing grounds after 26 years of a debilitating civil war, during which Indian trawl fishers came to seize ‘their’ fishing grounds. In the current post-war era, North Sri Lankan fishers are fighting an uphill battle to regain control over their fishing grounds, which are still frequented by an Indian trawler fleet. In Sri Lanka's Northern Province, fishing is a major occupation, and one of the sectors hit hardest by the civil war between the Sri Lankan army and the guerrilla forces of the ‘Liberation Tigers for Tamil Eelam’. The aim of this paper is to understand how, and to what effect, North Sri Lankan fishers struggle to gain access to their fishing grounds in the face of intrusion by technologically superior South Indian trawlers. I will deal with this question by looking into collective strategies adopted by fishers in Northern Sri Lanka. Collective action in relation to resource use is usually studied with a focus on resource management, i.e. how resource users collectively devise institutions to achieve sustainable resource use. This form of collective action assumes a certain level of control over space as well as a 'sovereign self’ (Agrawal 2008). With a large foreign fleet intruding into Sri Lankan fishing grounds, and with high levels of repressive militarization prevalent in the area, the assumption of such a 'sovereign self’ is likely problematic. This paper will explore a more political perspective for understanding collective action processes in such contexts, focusing on the ability of fishers to mobilize and contest their exclusion from resource access. In the course of history, fishers have formed movements, unions and cooperatives in many countries and even in circumstances of extreme power asymmetries, they adapt, respond, strategize and search for opportunities to gain access (for an overview see Kurien 2013). The conditions and manner in which they do so, and the consequences of their actions, should be central to the study of collective action (Jentoft 2007). The next section theorizes competing approaches to resource access and collective action, after which Section 3 discusses fieldwork methodology. I subsequently contextualize the marginality of North Sri Lankan fishers in order to understand their inability to gain meaningful access to Palk Bay fishing grounds. Section 5 then discusses in detail the impossibility for North Sri Lankan fishers to engage in collective action, concluding that we require a more relational and political approach to access and collective action in order to understand the reproduction of marginality in commons settings. The purpose of this section is to develop a conceptual understanding of how unequal access to commons is (re)produced and contested. More specifically, I aim to understand how, and to what effect, small-scale fishers contest encroachment of competing foreign fishing fleets into their territories. I do so by engaging with different approaches to two key concepts: resource access and collective action. Building on the useful distinction in commons literature identified by Johnson (2004),2 I contend that we need to make two shifts: one is from understanding access as a bundle of rights to access as a bundle of power (Ribot and Peluso 2003); and two is from collective action geared at fostering institutions for resource stewardship towards collective action geared at contesting power structures. 2.1. Access: right or ability? The precise meaning of ‘access’ to natural resources, and the mechanisms through which access is obtained has been the subject of much academic debate. I distinguish between two approaches: one that understands access in terms of rights and one that understands access in terms of abilities. The first approach is a rights based approach. In their seminal article on property rights and fisheries, Schlager and Ostrom (1992) posit that marine resources are managed through two operational-level property rights: access rights and withdrawal rights. Access is defined as “the right to enter a defined physical property”, whereas withdrawal refers to “the right to obtain the ‘products’ of a resource” (ibid., 250). Such property rights stem from rules, which are generally agreed-upon prescriptions that forbid or permit activities for a group of people (von Benda-Beckman et al. 2006). This approach presumes that people's access is the result of their property rights to a particular resource, and the legitimizing source of that right is anchored in laws of various kinds (customary or statutory, local, national or international). However, outcomes of resource allocation and appropriation processes may be at odds with the allocation of rights. Ribot and Peluso (2003) unpack why some are able to benefit from resources, regardless of whether they have rights to them. They define access as the ability to benefit from resources, rather than merely having the right to benefit, arguing that whereas property relations may be defined by rights, “access is about ability, a term that is akin to power” (Ribot and Peluso 2003, 155). Similarly, Sikor and Lund (2009, 4) emphasize that “people may hold property rights to some resources without having the capacity to derive any material benefit from them”. To clarify their position, Ribot and Peluso (2003) define a range of possible ‘mechanisms’ through which people may gain, control and maintain access, apart from right-based mechanisms. These mechanisms are often determined by the relations between resource users with power holders and include access to technology, authority, knowledge and identity (ibid.). To explain why social actors have differential access to resources, the authors put forward the idea of a ‘bundle of powers’, as opposed to a ‘bundle of rights’.3 This relational approach to access suggests that controlling access to resources is determined by individuals’ and communities’ relationships with other resource users and authority holders at various scale levels. When fishing communities were isolated entities, access would likely have been a matter of negotiating access rights within the community, resulting in a form of self-governance outside the purview of the state. However, in an increasingly interconnected world, fishing communities are usually interlinked with and impacted by processes originating at supra-local levels (Berkes 2008; Bavinck et al. 2014). Commons scholars have extensively engaged with the multi-level drivers of institutional erosion. Berkes (2008), for example, argues that local level rules are necessary but insufficient to deal with commons management in a multi-level world. These observations have led to various prescriptive values around the notion of multi-level governance, such as building cross-scale partnerships and multi-layered, vertical and horizontal institutional linkages. While these normative assertions may provide some direction to governers, they may also easily conceal the mechanisms through which some users may be excluded from access (Armitage 2008). Nayak and Berkes (2011) nicely illustrate this by asking ‘whose rights and entitlements’, ‘who has power and control’ and ‘who take the decisions’, pointing out that interactions between actors at multiple scale levels often drive processes of ‘decommonization’, typically associated with dispossession and marginalization. A focus on how power is mediated across scales may help to understand how higher level political-economic forces often drive processes of marginalization (Blaikie and Brookfield 1987; Adger et al. 2005) and why normative governance principles may often not become actualized in practice (Armitage 2008). This also corresponds with Agrawal's (2014) call for more research attention to how differentiated outcomes in commons settings are shaped. 2.2. Collective action: self-governance or contestation? Scholars concerned with collective action seek to understand under what conditions people are able to cooperate in pursuing shared goals and producing public goods. I distinguish two different approaches. The first approach departs from the game theoretical question of whether and how individual actors are able to overcome egoistic, free-riding behaviour and engage in collective action for producing public goods. In the context of common pool resources, Ostrom (1990) concludes that “[e]xtensive fieldwork has by now established that individuals in all walks of life and all parts of the world voluntarily organize themselves so as to gain the benefits of trade, to provide mutual protection against risk, and to create and enforce rules that protect natural resources” (Ostrom 2000, 138). This perspective on collective action has been widely used to “explain why and how individuals and groups, who rely heavily on specific natural resources, develop autonomous institutions for their management” (Bavinck et al. 2014, 147). This approach to collective action suggests a certain capacity for self-governance, in the sense of communities being capable of exercising control over their fishing grounds by establishing, implementing and monitoring rules, sanctioning violators, and curbing outsiders. Ostrom and others have identified a range of attributes of the resource, the community, institutions and the ‘external environment’ that make self-governance of natural resources through collective action likely to occur (e.g. Agrawal 2001). Three of these preconditions are of immediate relevance to this paper: a clear definition of boundaries between user and non-users (principle 1), a minimal recognition of rights to organize by external government authorities (principle 7) and a nested system of governance if common pool resources exceed the local level (principle 8) (Cox et al. 2010). Although Ostrom's approach to collective action has achieved wide recognition, it has also received critique for being too apolitical, too functionalistic and too ahistorical (Agrawal 2003; Johnson 2004; Hann 2013; Forsyth and Johnson 2014; Saunders 2014). Araral (2014, 15) argues that ‘Ostrom's school of thought’ is largely valid for “small-scale, locally governed commons, which have been relatively insulated from external factors and rapid states of change”. Agrawal (2008) adds to this by highlighting the limits of framing communities as 'sovereign subjects’ as if they were operating in isolation from higher-level political structures and interests. Another critique relates to its focus on achieving ecological sustainability, which is problematic because “[t]here are reasonable grounds, building on contributions by scholars of resistance and subalternity – to think about other social aspirations and values that compete with sustainability – among them equity and political engagement” (Agrawal 2008, 58). These critiques bring us to a second approach to collective action, which has – to my knowledge – so far not been applied to the fisheries field. This approach questions how and under which conditions people engage in contestatory4 collective action in the form of protests and social movements (Tilly 1978; Zald and McCarthy 1979; Tarrow 1998; Piven 2008). Here, collective action is understood as a typically contestatory strategy of ordinary people to pursue their claims for social justice against better-equipped opponents, whether in the form of large scale insurrections or in more covert forms of resistance (Scott 1987). “Collective action becomes contentious when it is used by people who lack regular access to representative institutions […] who behave in ways that fundamentally challenge others or authorities” (Tarrow 1998, 3). I draw here on Van Zomeren et al. 's (2008) extensive review of the collective action literature and their identification of three key-conditions that can spur people's collective mobilization. These factors can serve as hints of where to look for understanding obstacles faced by resource users engaging in contestatory collective action. Perceived injustice – Following observations that neither objectively identifiable grievances nor relative deprivation predicted mass mobilization accurately, people's subjective feelings of injustice in terms of group-based inequality or deprivation came to be understood as a crucial factor spurring collective contestation (Van Zomeren et al. 2008). As Sen (2010) has eloquently argued, despite considerable ambiguity pertaining to what perfect justice may entail, humans are typically very capable of identifying situations of strong injustice. In the context of fisheries, Bavinck and Johnson (2008) argue that fishers’ perceptions of injustice are triggered when they are unable to act upon locally ingrained fishing rights. Perceived injustices related to frustrated access rights may thus spur passionate responses and lead to furious collective agitation. Yet, while perceived injustice is important in understanding people's motivational drivers, it is unable to explain when and how collective action is ignited or repressed. Perceived efficacy –Resource mobilization theory interprets collective action not so much as a passionate response to experienced injustice, but rather as a calculated strategic undertaking. For grievances to be translated into collective action, it requires the availability of and access to organizational networks, the availability of leadership figures and other resources (Zald and McCarthy 1979; Rademaker 1993, 246). While collective action can take place without an organization, its success will likely be limited to short-term mobilization for limited ends (Kurien 2013). Jentoft (2014) argues that small scale fishers must have an organization so as to speak with one voice and get others to listen, enhance their bargaining power, and engage in various forms of collective action.Focusing on collective action in high-risk contexts, Loveman (1998) emphasizes the importance of linkages to churches, political parties, labour unions, universities, and NGOs to “provide potential activists in high-risk contexts with resources such as funding, information, and access to physical and symbolic space” (ibid., 484). Finally, people's expectations are seen as a critical factor in determining whether collective action is effective in achieving its goal(s) or not (Van Zomeren et al. 2008). Perceived efficacy thus “refers to a sense of control, influence, strength, and effectiveness to change a group-related problem” (ibid., 513). Social identity – Cultural approaches “highlight the rhetorical and performative work that organizers do to construct sensibilities and generate moral shocks that draw people into participation” (Jasper 2011, 289). Social identity construction is argued to form a third necessary condition for collective action, since “[p]oliticized identity connects people to the structural plight of the disadvantaged group, resulting in an inner obligation to participate in social movement activities” (Van Zomeren et al. 2008). Nicholls and Fiorito5 argue that for social movements “storytelling is a strategic technique for constructing a political self that conforms to the established discourses of a struggle”. An effective story is one in which the storytellers are portrayed as the victim of an injustice, which resonates with and creates a moral shock among a large audience. More specifically, Li (2000) points out the importance of strategically articulating and positioning such stories around identity in a way that resonates with elite audiences. In order to understand how and to what effect small-scale user groups contest (processes leading to) marginalized access outcomes, I propose to take a political and relational approach to access and collective action. Resource users can secure access both by appealing to rights as well as through other structural and relational mechanisms. But such mechanisms and outcomes are not static, and when fundamentally incompatible with the fishers’ notions of justice, these outcomes may become the object of contestatory collective action. Whether such collective agitation actually ignites, and whether it succeeds in having an impact on the various access mechanisms at play, hinges on its ability to develop collective organizational strength and mobilize around a politicized social identity, as well as a conducive political context (Figure 1). Institutional design principles are powerful to diagnose why institutions that allocate access rights are (un)able to lead to effective resource stewardship, but they do not easily help in understanding underlying power-ridden struggles for access (Johnson 2004). I therefore argue that when we are primarily interested in why some groups are able to benefit from resources and others not, and how this changes over time, we need to study collective action more explicitly in terms of confrontations between unequal resource users, especially collective engagement with supra-local factors that allow or restrain ability to benefit from resources. 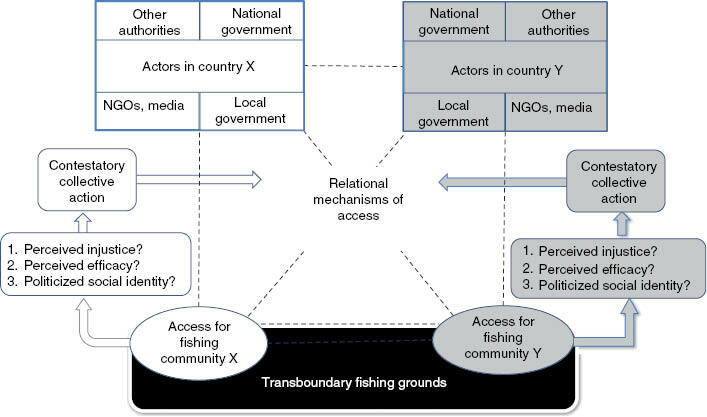 Dynamic scheme of access and collective action in a transboundary fisheries context. Studying a transboundary fisheries conflict comes with the practical complication of having to be in two countries at the same time (with both a border and a sea in between), and with having to deal with actors at various scale levels. Being part of a larger research project (see Acknowledgement), my Indian colleagues focused on the trawler dynamics on the Indian side of the Palk Bay (e.g. Menon et al. 2016; Stephen 2015), allowing me to focus on Northern Sri Lankan fisheries. This study builds on 14 months of mixed method fieldwork research in Northern Sri Lanka carried out in various periods between 2011 and 2014. First, I lived in three villages (Munai, Karainagar and Pesalai) for 20 days each so as to participate intensively in fishers’ daily routines and discussions, both before going to, and after returning from the sea. Actually joining them to the sea was prohibited by the omnipresent navy. The villages were all heavily affected by Indian trawlers, but differed in their recent (war) history, social and religious profile and cooperative functioning. Second, my research entailed repeated interactions (20–30 times) with nine village and district level formal (cooperative) and informal fisher leaders. These interactions consisted both of open interviews and discussions, as well as participation in their meetings at the village, district and national level, and were aimed at understanding their strategic deliberations. Third, I undertook a daily monitoring of fish catches and profits of 12 boats (four boats each in three villages) for a one-year period (April 2012–March 2013), which allowed for a basic level of bio-economic grounding. Fourth, 117 interviews with 71 fish traders, village authorities, academics, government officials, politicians, NGO staff, activists and clergy at different levels were held to relate the fisher struggles to the wider political context. The post-war context and transboundary setting provided specific research challenges. Given the sensitivity and rampant suspicion attached to the topic of Tamil mobilization (Somasundaram and Sivayokan 2013), winning fishing leaders’ trust posed an obvious challenge. As Azmi et al. (2013, 109) point out, “conducting interviews with silenced populations has implications for what can be addressed and what can be revealed by the fieldwork”. As a priest from Point Pedro aptly explained: “it's a saying here that we only open our mouths for food” (6 November 2012). In terms of protecting respondents’ anonymity, I never recorded interviews and rather worked on the basis of interview notes. In this paper I have kept the actual village names intact but ensured that quotes cannot be traced back to the respondent. I further dealt with these challenges by frequently returning to the same places and the same fisher leaders, and by spending a lot more time than originally anticipated discussing technical (i.e. less sensitive) topics such as fishing gears and seasonality which slowly built relationships of trust. This section aims to explain why North Sri Lankan fishers, despite being in the possession of fishing equipment and being endowed with fishing rights, have been unable to gain meaningful access to the Palk Bay. The fisheries sector in Sri Lanka's Northern Province consists of 11,800 fishing boats and employs 39,400 active fishers (Government of Sri Lanka 2013). If indirect employment is included approximately 20% of the province's population is dependent on the sector. Looking at the number of fishers and boats in operation and the level of fish catches, one could argue that the fisheries sector in Northern Sri Lanka had by 2013 ‘recovered’ from the civil war, as they had passed pre-war levels.6 In socio-economic terms, however, the sector is a mere shadow of its pre-war self, when it was flourishing and boat owners generally enjoyed a high economic status (Bavinck 2015). Based on data from three selected villages in Northern Sri Lanka, Table 1 highlights the current marginal economic status of the sector, with an average fisher making around 2000 USD per year,7 less than half of an average Sri Lankan rural household. Fishers argue consistently that catches are poor and declining, dominated by low value sardine, which results in building up increasing debts. The dire condition of the sector is the result of a complicated intersection of both post-war militarization and fishers’ associated lack of political access, and the intrusion of Indian trawlers. Fishing activity details of an average FRP fishing boata in three North Sri Lankan villages. aFiberglass reinforced plastic (FRP) boats (18 feet) with outboard engines (9–25 hp) are the most commons boats used in Northern Sri Lanka. bThe significantly higher figures in Pesalai are the result of purse seining. Higher fuel and labour costs make that per capita incomes are similar to the other two villages. Fisheries do not exist in sectoral isolation, but are shaped by and intertwined with the larger regional political economy. The victory of Sri Lankan armed forces over the Liberation Tigers of Tamil Eelam (LTTE) in May 2009 marked an end to decades of armed conflict. Contrary to optimistic predictions, the end of the civil war did not make way for a process of dialogue, introspection and reconciliation to come to terms with the brutalities of the recent past. Capitalizing on having crushed the LTTE, the government established a totalitarian corporatist State (David 2013), in which Sinhala chauvinist forces had a free hand to triumph over Tamil and Muslim minorities who hold second rank citizenship. The regime was also characterized by a high level of militarization, by which I mean the increasing control of armed forces over public institutions to guard regime interests (Kadirgamar 2013). In 2014, it was estimated that between 80,000 and 200,000 armed forces personnel8 were stationed in the Northern Province (with a total population of about one million). The post-war military project to monitor and control the lives of people in the north has continued and reinforced the war-time atmosphere of suspicion and fear. The ubiquitous, overbearing and intimidating presence of the military, in conjunction with non-uniformed intelligence agents, co-opted former LTTE cadres, and other recruited informants has created a suffocating climate of surveillance (Kadirgamar 2014). Fisher communities have arguably been among the worst hit civilian victims of the war. As Shanmugaratnam (2003, 24) explained during the war, “the pass system, restrictions on mobility and harassment in the name of security checks by Navy personnel made them feel like aliens and poachers in their own fishing areas”. Since 2010, the number of villages for which fishers require a Navy-issued fishing pass has decreased significantly, and spatial and temporal restrictions on mobility have been lifted. Yet, the armed forces continue to have a highly visible presence in all fishing villages, allegedly to combat smuggling of narcotics and provide security along the coast and at sea. Although the military hardly restricts fishing activity per se, several areas of the Northern Province coast are still designated as High Security Zones. This meant that in 2014, 90,0009 people were still internally displaced, many of them from fishing communities. Also, most of the proper harbours10 are used by the Navy and are therefore inaccessible to fishers who are interested in acquiring slightly larger offshore fishing boats. Then, in some places the authorities provided privileges to migrants from Southern Sri Lanka, for example a de facto monopoly on exploiting the lucrative sea cucumber. Finally, at a subtler but equally significant level, its presence stifles opportunities for fisher organization amidst a culture of fear and backs up political interference in fisher institutions (see Section 5). While the International Maritime Boundary Line (IMBL) between India and Sri Lanka was established in bilateral agreements in 1974 and 1976, in practice fishers from both countries continued to operate without restrictions across the Palk Bay (Vivekanandan 2011). There were occasional tensions over fishing technology, but regular interaction on the mid-sea island of Katchchativu (ibid.) as well as quick crossovers to Tamil Nadu for trading goods and watching the newest popular Tamil movies had created an overarching sense of brotherhood. The onset of civil war in 1983 radically changed this scenario in two ways. First, the border became securitized and cross-border fishing by Indian trawlers became entrenched in the dynamics of civil war that also played out at sea. For example, the LTTE regularly used the Indian trawlers as cover and for transporting goods and people across the bay (Gupta and Sharma 2008). The Sri Lankan Navy therefore considered Indian trawlers a significant security treat and was permitted to open fire against encroaching boats as per a government decision in August 1984 (Hettiarachchi 2007)11. Related to the securitization with the onset of the war, while the North Sri Lankan fishing sector was crippled due to heavy restrictions, in Tamil Nadu the trawler fleet rapidly expanded aided by State modernization subsidies (Bavinck 2001; Menon et al. 2016). The limited size of the Palk Bay and the abundance of prawn resources across the IMBL compelled Indian trawlers to increasingly operate in North Sri Lankan waters on which they became dependent over time. When Sri Lankan fishers resumed their operations during the cease-fire period (2002–2006) and especially after 2009, they were confronted by the presence of approximately 2000 trawlers frequenting their waters (Scholtens et al. 2012). The small Sri Lankan boats stand no chance against the 32–60 ft trawlers, which are equipped with engines up to 200 hp. Sri Lankan fishers have furiously opposed the trawlers on legal, ecological and social justice grounds. Tamil Nadu trawl operators, however, have consistently argued that they enjoy traditional fishing rights in the Palk Bay and that the legal basis of the maritime boundary agreements is slippery (Menon et al. 2016). Figure 2 illustrates how fishers from different parts of Northern Sri Lanka are confronted with trawlers from various parts of Tamil Nadu. While the sizable Sri Lankan Navy should technically be capable of stopping trawl fisher incursions,12 since 2011 the Navy's activity has been limited to chasing away trawlers using beam lights, and on occasion arresting trawl fishers.13 Whenever such arrests occur, it is typically followed by intense agitations by trawler owners that eventually result in India's Prime Minister and Sri Lanka's president resolving matters by releasing Indian fishers. This is a reflection of the politics of scale exercised by Indian trawler owners, who have consistently and effectively lobbied high level politicians to lash out against the Sri Lankan government for the allegedly brutal behaviour of its Navy (Stephen et al. 2013). Graphical representation of the Palk Bay. The dotted arrows represent the origin and direction of Indian trawlers.14 The rectangles indicate three case study villages. Source: modified from University of Jaffna, Dept. of Geography. In terms of access, North Sri Lankans now live in the ironic situation, that while enjoying fishing rights after 30 years of war, they are unable to really ‘benefit from the Palk Bay resources’ in the face of a powerful trawler fleet. Reasons for this include Indians’ superior trawler technology, their considerable political agency and access to authority, the mobilization of India's regional hegemony and the successful exploitation of ethnic identity politics in which the Sri Lankan Navy is framed as aggressive oppressor rather than as border guard. Sri Lankan fishers, on the contrary, neither have access to technology, nor to political agency at the local or national level. It is these dynamic mechanisms that explain the marginal access of North Sri Lankan fishers. Their limited ability to contest these mechanisms are elaborated in the next section. This section aims to understand limitations to effective forms of collective action among fishermen, building on the three preconditions for contestatory collective action as introduced in Section 2. “The trawler problem is very real here, with every day the uncertainty being there. […] We are lost. Last month alone five people already lost their nets: they can’t go fishing anymore” (Fisher leader Munai, 19 February 2012). Due to this risk, fishers often stay home or resort to less profitable operations very close to the coast. “These trawlers are hitting hard on our stomach; for 20 years we weren’t allowed to fish, now we are [allowed to go], but we can’t […]. The problem with the trawlers is that they come without lights because they’re afraid of the navy. But that's why we can’t see them in advance and take measures” (group of elderly Fishers in Munai, 8 March 2012). Third, echoing international concerns with trawl gear (Pauly et al. 2002), fishers are furious about the practice of bottom-trawling which, they argue, turns the sea bottom into a lifeless desert. Finally, North Sri Lankan fishers feel betrayed because: “Indian fishers come here freely, while we need a fishing pass to even put our feet into the sea” (Fisher Pesalai, 25 October 2012). The latter argument demonstrates that fishers’ frustrations are not about material interests alone. As argued in Section 2.3, fishers’ perceptions of injustice are triggered when they are unable to act upon locally ingrained fishing rights. Based on longitudinal research on fishing rights in Northern Sri Lanka, Bavinck (2015) argues that territorial user rights have survived the war and are still subscribed to by the fisher cooperatives. The intrusion of foreign trawlers challenges these customary held territorial rights, causing outrage and a strong feeling of injustice. In this situation of intensely violated rights in addition to material deprivation, one may intuitively expect fishers to engage in strong collective agitation. As demonstrated in Table 2, fishers have indeed mobilized in several occasions in the form of demonstrations, strikes, petitions, press conferences and even the hijacking of trawlers. The next sections will explain, however, why these agitations remained utterly marginal in terms of changing access outcomes in the Palk Bay. Instances of collective agitation by North Sri Lankan fishers (2011–2013). Feb-12 Demonstration against Indian trawlers in Mannar, geared at Gov. Agent and Fisheries Dept. “We could tell the fishers to go and catch the trawlers… they can do so immediately…. But the navy orders us not to do this. If we really call to catch them we’ll end up on the list of disappeared people” (Point Pedro Fisher leader, 7 November 2012). “Within a few hours officers from the armed forces had come to enquire about why we had not asked permission for doing this [announcing a strike] ... If you strike, you have to inform the Navy; but they would not allow us to go on strike. So now how can we launch a strike? I hardly dare talk” (FCS officer Point Pedro, 20 February 2012). “Muslims16 generally don’t go against the government… so the government is a bit more with us and takes us seriously. In Jaffna [however] all sangams are Tamil: when they open their mouth the government will look at it like some insurgent shouting … This is why we could organize some demonstrations, while Jaffna kept quiet. When we do so … we make sure that none of the banners says anything against the government, but just make livelihood statements; asking the government to give attention to our problems. … The forces always want to know when and where we are having meetings. An intelligence person will participate and sit at the meeting as if he were a representative …” (Fisher leader Mannar, 5 March 2012). Fisher leaders are particularly vulnerable and seek political patronage prior to organizing any form of collective protest. In one incident in March 2012, thousands of fishers from Northern Jaffna held a lengthy march holding banners reading ‘do not enter our territorial waters’, ‘do not cut our nets’ and ‘do not destroy our natural resources’.17 The march was organized by the local Fisheries Union, whose leadership had just been realigned under the patronage of a local politician loyal to the government. As a result, this demonstration became as much a political parade as a protest against trawlers, resulting in cynicism of observers and insiders alike. In addition to visible forms of intimidation, the lack of perceived efficacy also relates to war-related psychosocial problems prevailing in the area, including domestic violence, alcoholism, a strong sense of insecurity, distrust and powerlessness, which according to close observers (Somasundaram and Sivayokan 2013) negatively affect people's sense of agency. Over time, fishers have become increasingly disillusioned by their lack of agency and the impossibility of engaging in a meaningful way with the Navy, politicians and government officials in curbing trawlers. This minimum level of agency has been leading towards a silent and somewhat fatalistic process of adaptation, in which fishers have resigned themselves “to live with trawlers as a disease; perhaps this is our fate” (elder Fisher Karainagar, 11 Feb 2012). This adaptation has manifested itself, amongst others, by resorting to less profitable operations near shore to prevent encounters with trawlers or by resorting to purse-seining operations during daytime (when there are no trawlers) even though they deem this gear highly destructive themselves, or by staying home altogether. The trawler ‘problem’ has also pushed younger fishers to leave the sector, opting instead for manual labour work in the district's capital or in Gulf countries. A second element crucial to understand fisher's ability to act collectively is their organizational set-up. The primary form of organization among Northern Sri Lankan fishers are the fishermen's cooperative societies (FCS or sangams), which were set up by the Sri Lankan government in 1941 with the aim to strengthen the socio-economic standing of fishing communities (Wimalasena and Rupamoorthy 2005). FCSs operate under the jurisdiction of the Cooperative Department and the Department of Fisheries and Aquatic Resource Development (DFARD), and have therefore only limited autonomy. Compared to the historically defective functioning of fishermen's cooperatives in most parts of Sri Lanka (Wimalasena and Rupamoorthy 2005; Amarasinghe and Bavinck 2011), both fisher leaders and senior Department officials contend that cooperatives in the North have functioned exceptionally well. In Jaffna district, cooperatives are organized in a three-tier system: each coastal fishing village has a sangam, at the divisional level these 117 sangams are jointly organized in 13 Unions (samaasam). These Unions subsequently come together in an apex body at the district level under the name of Fisheries Cooperative Society Union's Federation (sammelanam). In the other Northern districts, the system is two-tiered, with village level FCSs and one Union at the district level. The role and strength of the cooperatives differs significantly from one village to another, but they all have faced a common set of challenges after the war. The first challenge concerns political interference. During the war, both the government and the LTTE saw control over the cooperatives as a way to gain strategic control over the coast. The LTTE had a vital interest in maintaining the cooperative system so as to raise funds through them. The Sri Lankan Navy also used the cooperatives for allocating fishing passes, which were compulsory until 2011. “These days cooperatives are losing importance; things have become chaotic, look at how cooperative elections were cancelled. Private traders are taking over things, and corruption has increased. There is no control as in the days of the LTTE” (former Fisheries Department official, 15 November 2011). “We had 17 employees in 2003; we were flourishing. … This has all collapsed in about 7 years. The reason is simple: there's no fish coming in. Fishers can’t pay back their loans, and thus don’t want to come here anymore. No fish, no sangam. … Also there's no external aid coming anymore to provide benefits to fishers” (Former sangam leader Pesalai, 13 Sept 2012). Third, post-war development of roads linking the north to the south has resulted in an influx of fish traders, credit providers and suppliers of fisheries materials. While during the war many cooperatives had a virtual monopoly on marketing and transporting of fish, the provision of loans, the provision of fuel and net materials, the post-war ‘opening-up’ of the market has eroded the importance of the cooperatives. In sum, cooperatives have demonstrated remarkable resilience during and after the war, and their layered structure of meetings and representation is still intact, and in many villages the fishing cooperatives remain important. Yet, their collective capacity to build collective rules, mobilize fishers and represent them to the outside world has become extremely limited. In Section 2.2, I argued that another precondition for effective contestatory collective action is a group's ability to politicize its identity, and articulate its struggle in a way that resonates with larger (elite) audiences. This provides North Sri Lankan fishers with a dilemma. The hegemonic Tamil discourse, promulgated by the Tamil elite to secure significant international support, frames ethnic Sri Lankan Tamils as victims of Sinhala oppression. Within this framing, Sri Lankan Tamils can count on powerful allies, including Tamil Nadu, a sizable Tamil diaspora, and to some extent India and even the larger international community. The fisheries conflict in the Palk Bay, however, is one between two sets of Tamil fishers and therefore cuts into this usually powerful alliance. As a result, fishers are caught in a dilemma of how to strategically frame their plight. Sri Lankan fishers have on occasion framed their problem as a manifestation of the Tamil-Sinhala ethnic dichotomy, for example by accusing the Sri Lankan government of deliberately letting Indian fishers fish in their waters in order to create friction between Tamils from both countries.18 Fishers have also accused the Sri Lankan government of using the conflict as a geopolitical joker, which can be used whenever there is the need to improve rapport with India.19 However, fishers simultaneously realize that they need to get the Sri Lankan government on their side to settle this bilateral fisheries conflict. “We can’t do such things again, I won’t allow the fishers. It is used by our government to undermine our relation with India, and that's precisely what they are looking for […]. We shouldn’t fall into that trap. Not that I care about those international relations, but it would harm my people. The government wants to get Tamils to oppose India” (Parish priest: 11 November 2011). In sum, the lack of alignment between regional ethnic politics, and the particular structure of the fisheries conflict, does inhibit fishers from politicizing their identity and generating a powerful process of mobilization. The aim of this paper was to make sense of small-scale fishers’ struggle for resource access when confronted with competition from a foreign fishing fleet. I framed this in terms of the capacity of fishers to engage in a process of collective action geared at securing access to marine resources. During post-war years Northern Sri Lankan fishers came to possess full fishing rights in Sri Lankan fishing grounds. However, these rights proved futile in the face of the intrusion of the technologically-superior Indian trawlers. This paper has reflected extensively on how we should approach fishers’ collective action under such circumstances of unequal and frustrated access. Drawing on literature of contestatory collective action proved useful in demonstrating the hurdles faced by fishers to mobilize and lay effective claims on their fishing grounds. Post-war militarization and associated surveillance, inadequate political representation of the Tamil population, a weakening cooperative organization and the inability of ethnicity to form a basis of collective action proved crucial factors. The presence of these factors effectively block fishers from confronting trawlers or compelling authorities (to assist them) in doing so. This not only compromises the livelihoods of small-scale fishers in Northern Sri Lanka, but also results in an absence of resource management. The lack of political space for collective contestation has forced fishers into a process of silent adaptation to the reality of trawler intrusions. These observations have led to two conclusions. First, I have argued that possessing legitimate rights (derived from statutory or customary law) to access and exploit local fishing grounds, without the capacity to curb outsiders like foreign fishing fleets, constitutes a fictitious form of access. To understand why fishers are unable to compete with, or confront foreign trawlers, we need to appreciate the relational nature of resource access. Even though the lack of secure access of fishers is the direct result of the intrusions of foreign trawlers, a community's capacity to control and exploit a resource is a function of their ability to get support from state and non-state actors to effectively prevent external actors from infringing on their rights. Deriving from this I draw a second conclusion. In situations such as these, our attention needs to shift from collective action geared at self-governance for resource management, to contestatory collective action geared at gaining support from state- and non-state actors. Collective action in terms of self-governance has been valuable in explaining how fishers engage in local resource management through age-old practices of collective action. However, this literature is less able to explain how powerful forces external to the local system (such as foreign fishing fleets) undermine local systems of management. In line with Agrawal's observations (2003), I argue that, in such circumstances, assuming a level of sovereignty or self-governance of the community is problematic. I therefore conclude that struggles for resource access are not only struggles for legitimate property rights, but equally about the ability to influence the multiple mechanisms of access through processes of contestatory collective action. 1This refers to fishers living in the Northern Province of Sri Lanka, in particular in the districts Jaffna, Kilinochchi and Mannar. 2Johnson (2004) makes a distinction between ‘mainstream common property discourse’ (which is mostly concerned with understanding conditions under which institutions can foster resource stewardship) and the more political and historically specific entitlement approach (which is normatively concerned with sustaining resource access for vulnerable groups). 3This is not to suggest that rights are unimportant: “While rights may have no value at a certain point in time, the fact that they are somehow enshrined in legislation or recognized by some politico-legal institution may come in handy if circumstances change” (Sikor and Lund 2009, 6). 4The phrase ‘contestatory collective action’ has been used instead of the more common ‘contentious collective action’, to avoid the ambiguity whether it is the process of collective action or rather the term itself that is contested. I thank an anonymous reviewer for this suggestion. 5Nicholls W. and T. Fiorito. Workshop on Story-telling and Emotions. In: Short Intensive Course ‘Resistance Politics: Microfoundations of collective action’. 21 May 2013, University of Amsterdam. 6Fish catches increased to 83,000 mt in 2013, compared to 76,000 mt in 1983. However, during the same period, in Sri Lanka as a whole fish production tripled (Government of Sri Lanka 2013) http://www.fisheries.gov.lk/content.php?cnid/ststc. 7Income was calculated as catch value minus fuel costs minus depreciation and maintenance divided by the number of fishers involved. 8Faced with international pressure to demilitarize, figures of military presence are highly controversial and vary considerably. See explanation see http://blog.crisisgroup.org/asia/2014/03/25/the-forever-war-military-control-in-sri-lankas-north/. 10i.e. Kankesanturai, Karainagar, Point Pedro, Myliddy and Talaimannar. 11The latest report of Indian fishers being allegedly killed stems from April 2011, when four fishermen from Rameshwaram disappeared. 12Personal communication with a Navy officer, January 2014. 13For details on trawler arrests see Scholtens (2015). 14There are no precise data on the number of boats crossing into different parts of Sri Lankan waters. The arrows are based on anecdotal information from Indian and Sri Lankan fishers, direct observation and interviews with the Sri Lankan Navy. 15The FCS in the village of Karainagar estimated that in 2010 and 2011 alone, approximately 23,000 USD of damage was done to fishing nets, resulting in many families incurring debts. 16In Sri Lanka, Muslims are generally considered a distinct ethnicity, even though the majority speaks Tamil as first language. 17http://www.ceylontoday.lk/51-4025-news-detail-lankan-fishermen-protest.html, accessed 22 Dec 2014. 18E.g. http://www.tamilnet.com/art.html?catid/13&artid136589, accessed 25 March 2015. 19For example, the Sri Lankan president regularly released groups of Indian fishermen as a gesture of goodwill prior to important bilateral meetings (Scholtens and Bavinck 2014). I wish to thank the University of Jaffna (Department of Geography) and the University or Ruhuna (Department of Agricultural Economics) for their intellectual and logistical support and Nilam Hamead for his invaluable patience and accuracy as an interpreter. I wish to thank the Dutch research programme COCOON (NWO/WOTRO project W076830200) for funding this research. Finally I am grateful to Dr. Ajit Menon, Dr. Maarten Bavinck and Dr. Dennis Rodgers and three anonymous reviewers for their valuable comments on earlier drafts. Adger, W. N, Brown, K. and Tompkins, E. L (2005). “The Political Economy of Cross-Scale Networks in Resource Co- Management In: Ecology and Society 10(2): 9. Agrawal, A. (2001). Common Property Institutions and Sustainable Governance of Resources. World Development 29(10): 1649–1672. http://dx.doi.org/10.1016/S0305-750X(01)00063-8. Agrawal, A. (2003). Sustainable Governance of Common Pool Resources: Context, Methods, and Politics. Annual Review of Anthropology 32(1): 243–262. Annual Reviews 4139 El Camino Way, P.O. Box 10139, Palo Alto, CA 94303-0139, USAhttp://dx.doi.org/10.1146/annurev.anthro.32.061002.093112. Agrawal, A. (2008). Sustainable Governance of Common-Pool Resources: Context, Method, and Politics In: The Contested Commons: Conversations between Economists and Anthropologists. Bardhan, P. and Ray, I eds. : 46–65. Oxford: Blackwell. Agrawal, A. (2014). Studying the Commons, Governing Common-Pool Resource Outcomes: Some Concluding Thoughts. Environmental Science and Policy 36: 86–91. http://dx.doi.org/10.1016/j.envsci.2013.08.012. Amarasinghe, O. and Bavinck, M. (2011). Building Resilience: Fisheries Cooperatives in Southern Sri Lanka In: Poverty Mosaics: Realities and Prospects in Small-Scale Fisheries. Jentoft, S and Eide, A eds. : 383–406. Dordrecht: Springer Netherlands. http://dx.doi.org/10.1007/978-94-007-1582-0. Araral, E. (2014). Ostrom, Hardin and the Commons: A Critical Appreciation and a Revisionist View. Environmental Science and Policy 36: 11–23. http://dx.doi.org/10.1016/j.envsci.2013.07.011. Armitage, D. (2008). Governance and the Commons in a Multi-Level World. International Journal of the Commons 2(1): 7–32. http://dx.doi.org/10.18352/ijc.28. Azmi, F., Brun, C. and Lund, R. (2013). Young People's Everyday Politics in Post-Conflict Sri Lanka. Space and Polity 17(1): 106–122. http://dx.doi.org/10.1080/13562576.2013.780716. Bavinck, M. (2001). Marine Resource Management: Conflict and Regulation in the Fisheries of the Coromandel Coast. New Delhi: Sage. Bavinck, M. (2015). Fishing Rights in Post-War Sri Lanka: Results of a Longitudinal Village Enquiry in the Jaffna Region. Maritime Studies 14(1): 1–15. http://dx.doi.org/10.1186/s40152-014-0019-0. Bavinck, M. and Johnson, D. (2008). Handling the Legacy of the Blue Revolution in India – Social Justice and Small-Scale Fisheries in a Negative Growth Scenario. American Fisheries Society Symposium 49: 585–599. Bavinck, M., Sowman, M. and Menon, A. (2014). Theorizing Participatory Governance in Contexts of Legal Pluralism – a Conceptual Reconnaissance of Fishing Conflicts and Their Resolution In: Conflicts over Natural Resources in the Global South: Conceptual Approaches. Bavinck, M, Pelligrini, L. and Mosterd, E. eds. : 1–226. London: Taylor & Francis Group. http://dx.doi.org/10.1201/b16498-10. Berkes, F. (2008). Commons in a Multi-Level World. International Journal of the Commons 2(1): 1–6. http://dx.doi.org/10.18352/ijc.80. Blaikie, P. and Brookfield, H. (1987). Land Degradation and Society. London: Methuen. Cox, M., Arnold, G. and Villamayor Tomás, S. (2010). A Review of Design Principles for Community-Based Natural Resource Management. Ecology and Society 15 http://hdl.handle.net/10535/7430. David, K. (2013). Modalities of an Emergent Dictatorship. Economic and Political Weekly 48(7): 30–33. Forsyth, T. and Johnson, C. (2014). Elinor Ostrom's Legacy: Governing the Commons and the Rational Choice Controversy. Development and Change 45(5): 1093–1110. http://dx.doi.org/10.1111/dech.12110. Gupta, C. and Sharma, M. (2008). Contested Coastlines: Fisherfolk, Nations and Borders in South Asia.. New Delhi: Routledge. Hann, C. (2013). Evolution, Institutions, and Human Well-Being: Perspectives from a Critical Social Anthropology. Journal of Bioeconomics 16(1): 61–69. http://dx.doi.org/10.1007/s10818-013-9168-2. Hettiarachchi, A. (2007). Fisheries in the Palk Bay Region: The Indian Factor. Journal of National Aquatic Resources Development Agency 38: 1–15. Jasper, J. (2011). Emotions and Social Movements: Twenty Years of Theory and Research. Annual Review of Sociology 37(14): 1–19. http://dx.doi.org/10.1146/annurev-soc-081309-150015. Jentoft, S. (2007). In the Power of Power: The Understated Aspect of Fisheries and Coastal Management. Human Organization 66(4): 426–437. http://dx.doi.org/10.17730/humo.66.4.a836621h2k5x46m2. Jentoft, S. (2014). Where There Is A Will: The Norwegian Model of Fisheries Governance Is Worth Examining. Samudra 68: 22–25. Johnson, C. A (2004). Uncommon Ground: The ‘Poverty of History’ in Common Property Discourse. Development and Change 35(3): 407–433. http://dx.doi.org/10.1111/j.1467-7660.2004.00359.x. Kadirgamar, A. (2013). The Question of Militarisation in Post-War Sri Lanka. Economic Political Weekly 48(7): 42–46. Kadirgamar, A. (2014). Violence in the Time of ‘no-War.’. Himal 27(3): 30–39. Kurien, J. (2013). Collective Action and Organizations in Small-Scale Fisheries. Rome: FAO. http://www.fao.org/3/a-i3540e.pdf. Li, T. M (2000). Articulating Indigenous Identity in Indonesia: Resource Politics and the Tribal Slot. Comparative Studies in Society and History 42(1): 149–179. http://dx.doi.org/10.1017/S0010417500002632. Loveman, M. (1998). High-Risk Collective Action: Defending Human Rights in Chile. American Journal of Sociology 104(2): 477–525. http://dx.doi.org/10.1086/210045. Menon, A., Bavinck, M. and Stephen, J. (2016). The Political Ecology of Palk Bay Fisheries: Geographies of Capital , Fisher Conflict, Ethnicity and Nation-State. Antipode 48(2): 393–411. http://dx.doi.org/10.1111/anti.12181. Nayak, P. K and Berkes, F. (2011). Commonisation and Decommonisation: Understading the Processes of Change in the Chilika Lagoon, India. Conservation and Society 9(2): 123–145. http://dx.doi.org/10.4103/0972-4923.83723. Pauly, D., Christensen, V., Guénette, S, Pitcher, T. J, Rashid Sumaila, U, Walters, C. J, Watson, R. and Zeller, D. (2002). Towards Sustainability in World Fisheries. Nature 418: 689–695. http://dx.doi.org/10.1038/nature01017. Piven, F. F (2008). Can Power from Below Change the World?. American Sociological Review 73(1): 1–14. http://dx.doi.org/10.1177/000312240807300101. Rademaker, L. (1993). Benaderingen van Collectief Protest. PhD thesis. University of Groningen. Saunders, F. P (2014). The Promise of Common Pool Resource Theory and the Reality of Commons Projects. International Journal of the Commons 8(2): 636–656. http://dx.doi.org/10.18352/ijc.477. Schlager, E. and Ostrom, E. (1992). Property-Rights Regimes and Natural Resources: A Conceptual Analysis. Land Economics 68(3): 249–262. http://dx.doi.org/10.2307/3146375. Scholtens, J. (2015). Limits to the Governability of Transboundary Fisheries: Implications for Small-Scale Fishers in Northern Sri Lanka and Beyond In: Interactive Governance for Small-Scale Fisheries: Global Reflections. Jentoft, S and Chuenpagdee, R. eds. Dordrecht: Springer Netherlands. http://dx.doi.org/10.1007/978-3-319-17034-3_27. Scholtens, J. and Bavinck, M. (2014). Lessons for Legal Pluralism: Investigating the Challenges of Transboundary Fisheries Governance. Current Opinion in Environmental Sustainability 11: 10–18. http://dx.doi.org/10.1016/j.cosust.2014.09.017. Scholtens, J., Bavinck, M. and Soosai, A. S (2012). Fishing in Dire Straits. Economic Political Weekly 47(25): 87–96. Scott, J. (1987). Weapons of the Weak. Everyday Forms of Resistance. New Haven: Yale University Press. Sen, A. (2010). The Idea of Justice. London: Penguin Books. Shanmugaratnam, N. (2003). Jaffna's Fishing Communities: Persistent Crisis and Possible Solutions. Polity 1(5): 24–26. Sikor, T. and Lund, C. (2009). Access and Property: A Question of Power and Authority. Development and Change 40(1): 1–22. http://dx.doi.org/10.1111/j.1467-7660.2009.01503.x. Somasundaram, D. and Sivayokan, S. (2013). Rebuilding Community Resilience in a Post-War Context: Developing Insight and Recommendations – a Qualitative Study in Northern Sri Lanka. International Journal of Mental Health Systems 7(3): 1–24. http://dx.doi.org/10.1186/1752-4458-7-3. Stephen, J. (2015). Fishing for Space: Socio-Spatial Relations of Indian Trawl Fishers in the Palk Bay, South Asia, in the Context of Trans-Boundary Fishing. PhD thesis. University of Amsterdam. Stephen, J., Menon, A., Scholtens, J. and Bavinck, M. (2013). Transboundary Dialogues and the ‘Politics of Scale’ in Palk Bay Fisheries: Brothers at Sea?. South Asia Research 33(2): 141–161. http://dx.doi.org/10.1177/0262728013487633. Tarrow, S. (1998). Power in Movement: Social Movements, Collective Action and Mass Politics in the Modern State. Cambridge: Cambridge University Press. http://dx.doi.org/10.1017/CBO9780511813245. Tilly, C. (1978). From Mobilization to Revolution. Reading MA: Addison-Wesley. Van Zomeren, M, Postmes, T. and Spears, R. (2008). Toward an Integrative Social Identity Model of Collective Action: A Quantitative Research Synthesis of Three Socio-Psychological Perspectives. Psychological Bulletin 134(4): 504–535. http://dx.doi.org/10.1037/0033-2909.134.4.504. Vivekanandan, V. (2011). The Plight of Fishermen of Sri Lanka and India: The Legacy of the Civil War In: Conflict in Sri Lanka: Internal and External Consequences. Rhagavan, V. R ed. : 1–280. New Delhi: Vij Books India. von Benda-Beckman, F, von Benda-Beckmann, K and Wiber, M. G (2006). The Properties of Property In: Changing Properties of Property. Wiber, M. G ed. : 1–40. New York: Berghahn Books. Wimalasena, H. D and Rupamoorthy, K. (2005). A Review of the Present Status of Fishermen's Co-Operatives of Sri Lanka. Journal of the National Aquatic Resources Research and Development Agency 37: 41–58. Zald, M. N and McCarthy, J. D (1979). The Dynamics of Social Movements: Resource Mobilization, Social Control, and Tactics. Cambridge, MA: Winthrop Publishers.